Finnska strawberry bites have the wonderful soft texture and shape (solid tubes) of the Finnish Licorice and have the same manufacturer. These have the most amazing fresh strawberry flavor and are not too sweet. 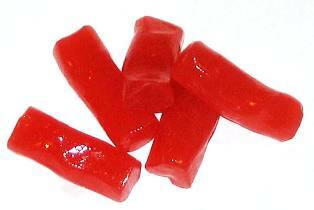 We believe these are one of the BEST strawberry licorice varieties you will ever have! Made in Finland.